Is Pinoy Street Foods Safe? Street foods are everywhere, not only in the Philippines but also on other parts of the world or in other countries to serve one’s instant hunger while on the road or street. I know there are mobile fast food carts that sell street foods which are safe to eat because they have valid sanitary permits and don’t sell dirty and exotic street foods. However, in the Philippines, there are street vendors which sells seemingly dirty street foods like the deep-fried chicken intestines which they call IUD or “isaw manok”; the pig’s ears which they call “walkman”; the cubed and grilled blood of either chicken or pig which they call “betamax”; the grilled chicken head which they call “helmet”; and other exotic street foods which are seemingly dirty which most Filipino street vendors invented and experiment. Are these exotic street foods safe to eat and would not irritate one’s stomach? 3. 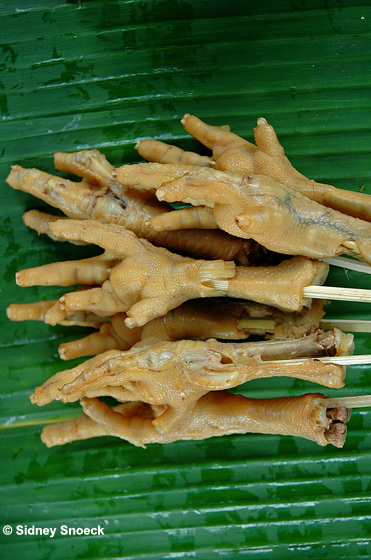 Quek quek or Toknanay – hard-boiled chicken or quail eggs dipped in an orange batter and then deep fried. 4. Banana and Kamote cue –banana or sweet potato (kamote) chops covered with brown sugar that are deep fried and hook with bamboo sticks. 5. Samalamig – a variety of mixture of coconut juice or a gulaman-gelatin mix. 6. Manggang Hilaw – green mango with shrimp paste (bagoong) toppings. 7. Turon – a pure slice of banana or sometimes with a slice of jackfruit sandwich together and wrap with spring roll wrapper and then deep fried. 8. Maruya or Biruya – papaya or banana fritters. 9. 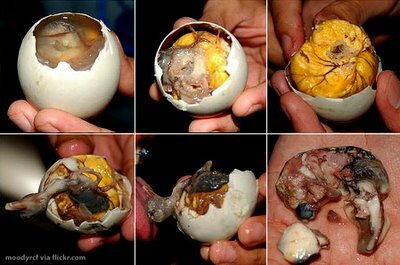 Balut – a hard-boiled duck egg with a duck fetus inside. 10. Penoy – a hard-boiled duck egg without duck fetus. But whether exotic or not, street foods are not really quite clean foods as they may seem to be because these foods are exposed to a variety of dirt, smog, and chemicals lingering in the streets, match with multiple hungry dirty flies flying around and licking these foods with their bacteria-filled tongues.